It’s just 12 days till school’s out for summer here in Wales and already I am compiling a list of things to do to stop the inevitable moans of “mum, we’re bored” – plus there’s a chance to win with my Nando’s gift card giveaway. You really need a plan, don’t you? Otherwise, it’ll be a late start each morning, mooching around playing iPads or Xbox games till noon and then you’ll find it will be too late to make the most of the day. One or two days like this for the kids to chill is entirely acceptable – but 6 weeks of it? Not so much. And that’s without considering the dramatic hike in the food bill and the need to provide lunch. Believe me, I really appreciate school dinners at the end of July! There are only so many sandwiches I can stand but if like me, you’re not a particularly gifted cook, the whole feeding thing can become a bit of a debacle. 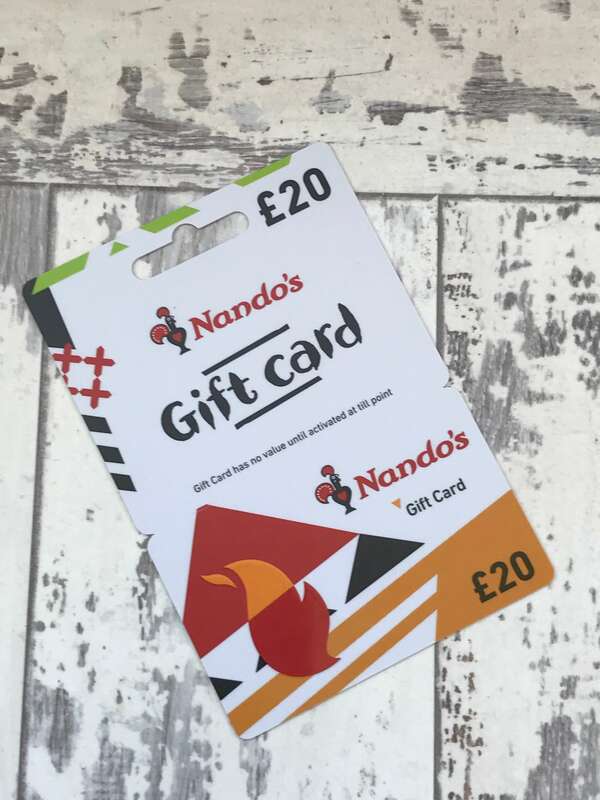 The temptation to eat out occasionally becomes too strong to resist and with an eye on your budget, I have a £20 Nando’s gift card to give away to one lucky winner. You could try their new Fresco Burger – PERi-PERi chicken breast, smashed avocado and tangy pickled cucumber, topped with rocket. Then there’s the Butterfly Burger – two succulent chicken breasts joined by crispy skin, packed in a Portuguese roll and topped with tomato and lettuce. There is a selection of veggie options to including the Supergrain Salad – a fresh mix of grains, greens and beans with avocado chunks and an avocado & buttermilk dressing, served on mixed salad leaves. Or what about the Veggie Cataplana? Chickpeas, chargrilled veg and beans in a spicy tomato and coconut sauce are served on spicy rice and sprinkled with toasted coconut shavings. All I want to know is your best idea for keeping the kids entertained – and preferably as cheaply as possible. Entry to the Nando’s gift card giveaway is via the GLEAM widget and the usual terms and conditions apply which you can find on my giveaways page. No cash alternative and 1 entry per household. You’ll also find the Nando’s gift card terms and conditions here. Check the location of your nearest Nando’s here. The giveaway is open to UK entrants only and ends at 11:59 pm on Sunday 12th August. I can’t wait to hear your boredom busting ideas and the best ones will be published in a post in a few weeks’ time. "Making ANY Money From Your Blog? Time To Talk Tax"
This was so much easier when they are little, a picnic and any day out would do, or a crazy daisy and water fight in the garden, then we needed to get adventurous which involved searching for lots of discount codes, for goApe, kayaking, badminton, tennis, science museums, amusement parks. Now in teens he just needs me to bank roll tennis/badminton courts plus stock of ball/shuttlecocks, trainers for running, art materials for painting, camping kit. Lots of play dates and days out. fill a jar with folded bits of paper – the fun jar – write things like ‘picnic at the park’, build a den, messy play, un-birthday party, put on a show, once all the chores have been done they get to pick a fun thing to do! I like that one Maria – especially the bit about doing chores first! Give them jobs to do, they will soon find something more fun to do instead! Plan for wet days . . . collect materials (felt, paper, card), glitter glue and buy some card blanks and get the children to make cards for Christmas for friends and family. It may be out of season but they will get absorbed in their crafting and enjoy their makes! Paddling pool and garden games out on sunny days. Inviting their friends round so they keep each other busy. Local playgrounds. Rewards and a good store of board games, card games, outdoor games and gadget games. A photo-a-day challenge can be great, because it naturally inspires plans of where to go and what to do to create fun pictures. It provides a bit of motivation to get out of the house! Keep them busy with things they want to do. We compile a summer bucket list and display it, with a list of things we want to do. It includes days out (ie zoo, aquarium etc) and crafty days, as well as things to bake and films to watch! Lots of picnics! They make even a trip to the local park special. To avoid the dreaded phrase, “I’m bored” prepare a pack of cards with a chore on each. If the child says the dreaded phrase shuffle the cards and they pick a card and do the chore. My top tip for entertaining them is always be ready to adapt the plan for the day – if e.g. it pours with rain then have the picnic on the lounge floor, and get them doing origami (lots of instructions on the internet), etc. The best entertainment I remember as a child was a home made treasure hunt. Finding everyday items thst can be found around the area. Obviously safety (roads etc) have to be considered. send them to their nans for 2 weeks in the isle of wight! she will have the beach and be spoiled by nanny! Going camping in the garden. We bake, have in-home picnics and craft! Let them.set up a slime factory in the garden. We did this today. They had hours of fun! A plan for activities or crafts most days and TV and computers occasionally . Hard work but rewarding. Simply putting up a tent in the garden – they’ll be playing cowboys and indians all day long. I’d ask them what do they want todo and get them to write it down. If you think it’s an ok response fold in and put into a kitty so they can pick one out without them seeing what’s written down. If there’s more then one child they will take turns. You write stuff down too Perhaps get hubbies involved even grandparents. Have a jar full of sticks with different activity ideas on! Have a plan of what you want to do, also get the kids involved by asking them in advance what they want to do. I just get all the craft bits out with glue and paint and we just make stuff, always a winner. Get everyone to write 5 ideas and put them in a tub, when bored blind pick one! Days out to the coast, take a packed lunch, book train well in advance (cheaper). We love to go Geocaching. If you don’t know what it is it’s about using GPS to find hidden boxes. We even set our own up with lots of little toys in that kids can swap in and out. I do lots of crafts, baking and spend lots of time in the garden with my grandson. Picnics in the park is always a fun thing to do. Yikes. Really not looking forward to the holidays. The boredom levels are going to be absolute carnage. We’ve booked as many summer clubs and activities as we can, but there’s still going to be lots of gaps and frazzled parents. Make sure you have a plan for every day – access anything free eg parks, rivers, forests etc and make sure it is age appropriate. Older kids enjoy crayfish fishing. Get out & about, doesn’t need to be expensive but gets them away from e-devices. lots of low budget activities like treasure hunts, den building and lots of play dates with other bored little ones! Set up a Whatsapp group for friends and parents at school to share events and ideas. Organise playdays, picnics at the park, game of rounders etc. Pick up flyers from the local library or community centre loads of free and discounted activities going on. Love the Whatsapp group idea! Actually we live entering creative competitions. Writing stories, designing cakes. The prize is the motivation but the time it takes to a plan and perfect their enteries is priceless. Leave the house at every opportunity. My tip is to have activities planned for them during the summer holidays like going to the park, having movie days, going to local museums and going out walks. I’m lucky that my kids are old enough to keep themselves entertained. But when my Granddaughter visits, if the weather is good we spend time together gardening. She is very proud of sunflowers she has grown from seed. If weather is bad we either cook cakes together or spend time colouring in. Get them involved in daily stuff with you. My daughter’s currently cleaning the shower so excited because it’s so fun..plus it’s genuinely helpful and mummy has one less thing to do!! Ooh that’s a hard question…I keep them busy deciding on where to go or what to they most to do at the weekend and then get them to plan it! Plan ahead – some big expensive days out and other cheap or free days. Collect vouchers and coupon codes to keep costs down. And don’t be afraid to just do nothing some days – my kids love the lazy days! plan different activities to keep them entertained! a picnic at the local park! Distractions – exploring new environments and giving them tasks to do while your out. A days out jar, put suggestions for exciting days out on bits of paper and ask a child to draw one out ! Walks in the park, treasure hunts, trips to the local museums, painting rocks, picnics on the beach, baking cookies and swimming in the local pool. Have lots of arts & crafts ready, they are good for all weathers! Plenty of activities and plenty of charge on his tablet!! We have got a radio controlled car for my nephew when he visits. We’re enjoying mindfulness colouring books this summer. Even if the kids moan about joining in, I just start doing it and soon they come and join me too for a relaxing while. Early morning beach swims and sandcastles before it’s too hot, 7-10am! Get them to write a list of things they want to do! We have the trampoline in the garden, try to cycle as much as possible taking in parks and sometimes an ice cream (or coffee for me) at McDonalds – hey, it’s cheap and there’s free wifi. Only thing is, my 2 are 11 and 14 now and too big for several parks which isn’t so good! Still. we have the trampoline in the garden and it’s not expensive to ride the metro all day, sometimes taking in Ocean Beach pleasure park in South Shields. I’s £1.30 for a child daysaver which takes you all over the network and includes the Shields ferry. Other times we go up and down all the escalators in the shopping centre or we have a treasure hunt in the garden. We also have wardrobe clearouts to do and (one I hadn’t included), washing loads of dishes as the dishwasher has packed in on us just as we have been able to afford to replace the old oven and hob! Have lots of craft supplies available. And be prepared for mess. We spend a lot of time outside mainly at playgrounds and bring picnics. Our daughter has 9 weeks off in summer so its always hard trying to keep her entertained. I tend to organise catch up with other mums and their children and lots of visits to the park. We also have strawberry picking planned and yesterday our local baths had an inflatable fun session which is only £2.50. Have as many days out as possible! Let them have a friend over at least once a week. Have a plan of things to do such as local attractions, also swimming and arts and crafts board games if raining. We have a big holiday planned this year so have a really tight budgets to cover the rest of the 6 weeks. My kids would watch TV or play on tablets all day long given the opportunity and it makes them super grumpy so definately want to avoid screen time as much as possible. I have spent £20 on some river cobbles, acrylic paint and some varnish. So then plan is some days decorating the peppbles then lots of walksnin country parks/down the river etc to hide them and also look for what others habe hidden. Maybe a little bit of geocaching too. I find the best way to keep boredom at bay is to let children be creative. My little ones are still quite young but they love just being given crayons and paper, it keeps them occupied for hours! If near a beach we go shell or pebble hunting & kids of any age just love Rock pooling & you can while away an hr or two & best of all it’s free. We have National Trust membership which helps with cheaper days out. We have a whiteboard with a grid for August, the children each chose a couple of things to put on, then a few things I have seen advertised and we have a fair few activities spread out. We always take a picnic and they also know I will not buy ice-cream when we’re out (mean mum) , but we always have one for pudding after a day out. An ice cream each can add £10 onto a day out, with the money we save we can afford an extra day trip. Keep them busy – in the garden, playing games, going on bus rides – just keep it varied and interesting for them. My children are grown up now, but I use to love spending time with them in the holidays. Our local council use to produce a newsletter at the end of term detailing all sorts of local events and activities many of which were free of charge. We were always busy in local parks, playgrounds, paddling pools and “fun days” and even stable days in the local riding stables. Happy days I really miss them. Create a bucket list at the beginning of the summer with outdoor and indoor home activities. Give them a chore to do around the house each day and let them know why they need to do it and how it will benefit them in their future. Then hit the park so they use up the rest of their energy. Free local attractions and a packed lunch. Theres loads but how often do we visit them??! We go geocaching to alleviate boredom! Baking and decorating simple items like biscuits and cakes. Not only is it creative, but you have an end product that everyone can enjoy together. Lots of mini adventures to the park or river and collecting bits to use for craft activities another day. Doesn’t have to cost anything 🙂 also I’ve found that the kids are less likely to keep saying they’re bored etc when there are days labelled on the calendar with activities. They seem to be calmer when they have things to look forward to. I am lucky, mine don’t get bored. my middle daughter lives on the computer, youngest daughter plays out with her friends and youngest son just plays with his toys and watch youtube on his ipad. I keep a summer holiday bucket list of things to do and let the kids take it in turns to choose one of them when we have a free day. We keep a lot of the same routine, practicing piano, doing homework (that I set) and try new things like painting, together. Free, environmentally and child friendly and not to mention hours of fun!! For us, we make a list at the start of the holidays of things we want to do. This year it has involved walks along the canal, a bus and train journey, soft play (moans from mummy! ), picnics, trips to the park etc. And we choose one thing to do each day. Around that we have visited car boot sales and charity shops and picked up new board games to play. Different crafts are always a winner too! I don’t have any children but as a child myself I used to love colouring in! Variety and mixing it up – we can’t afford to be out every day so we mix days out with visits to the park, crafting days and baking days we seem to be keeping amused. Have you tried the book with no pictures yet? It mightnot be great o entertain thekids all day, but it is really good! Works for every age! Make sure you go out every day with them, even if it’s just a quick walk around the block. Google their favourite characters and include the word ‘print out’ – instant colouring in fun! And lastly, a big cardboard box provides more entertainment than a screen! Unless that’s just my daughter?! lol! Lots of day trips and walks / hikes with the family and dog. Playdoh…..keeps them busy for hours! I work full time so during the week my daughter will spend time at her grand parents and we make up for it at weekends. I actually don’t think it hurts kids to experience boredom every now and then. It encourages creativity and imagination, in my opinion. I let them run off their energy in the park or out in the yard if they are driving me crazy (lol) and we like to bake, craft and my girls favourite at the moment is playing ‘mummies and kittens’ which involves a lot of crawling around the floor and meowing! hee hee! we just bought the National trust annual pass and kids love it. lots of amazing family days out, bug hunts, garden visits and most places got amazing play areas. Ask them what they’d like to do over the holidays, write them all on pieces of paper and pop them in a jar! Let them pick out two different things every day! Today we baked and going on a nature hunt!